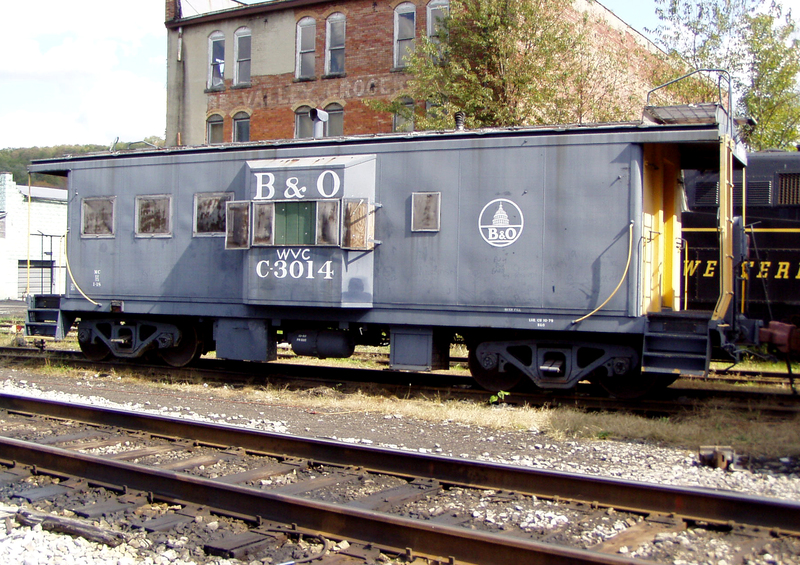 B&O #C-3014 is an all-steel caboose weighing 67,300 lbs. 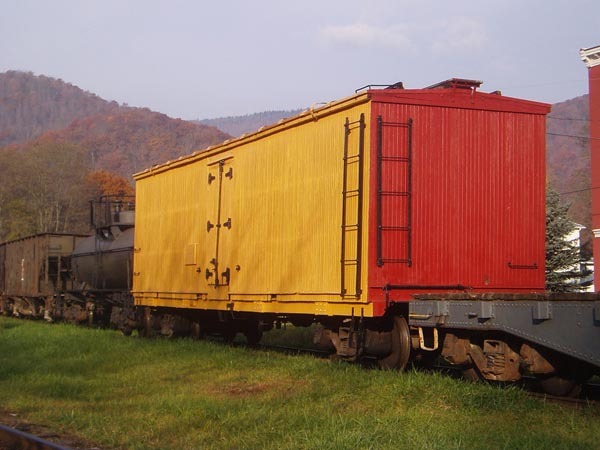 Built by International Car Corporation in 1966, it was one of 46 in the order that was the first bay-window cabooses to be purchased from a caboose builder. Until that time, all bay-window cabooses were built in the B&O shops. A gift from B&O Museum on 11/7/03, #C-3014 is currently leased and in service on the WVC. Our Fruit Growers Express refrigerator car (FRGX 56547) is a classic example of the ice-bunk reefer that helped perishables get to market in good condition. #56547 was a gift from the Baltimore & Ohio Railroad Museum. Splintered and missing siding has been replaced, and the first coat of paint has been applied. The ice hatch covers still need work, and the lettering has yet to be applied. #56547 arrived in Durbin, WV under a lease agreement for special train service use on the Durbin & Greenbrier Valley Railroad in 2004. It will be used for special trains on “The Durbin Route” along with the “Durbin Rocket”. Western Maryland Railway Coach No. 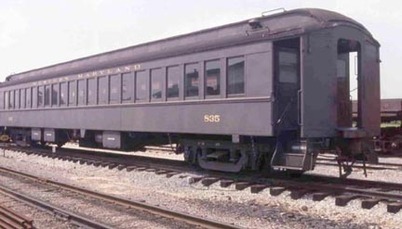 835 was built by Pullman in 1917 and has a capacity of 80 passengers. A small restroom is at each end. After years of service, #835 ended up in the collection of the Railroad Museum of Pennsylvania at Strasburg, PA. Since it did not fit into the Pennsylvania-oriented collection, in late 2005, #835 was given to the Western Maryland Railway Historical Society (WMRHS) based out of Union Bridge, MD. The board of the WMRHS saw the potential to get #835 back on the rails carrying passengers by leasing it long-term to our museum. Plans to move #835 from PA to WV missed several proposed dates as it was difficult to work out the schedule with the trucker. The coach was loaded on a special low-boy trailer with a detached bogie on Friday April 6 with the two trucks on a separate trailer. They arrived in Belington late on Monday evening, and the crane was in position on a cold Tuesday morning for the unload. The unload went well and was accomplished in about three hours. On April 10, 2007, the WM coach again sat on WV rails. Still to be done was the reinstallation of the steps and cut levers from one end that had been removed for clearance on the trailer. The interior has been cleaned and the exterior has a fresh coat of paint. The lettering will be redone next. Coach #835 is now in service on the Durbin & Greenbrier Valley Railroad. FMLX #120 is an 8,000 gallon, 40 ft, ICC Type 103 tank car with a light weight of 60,900 lbs. Built by General American Transportation Corp (GATX) in April 1953, it was formerly Ethyl-Dow Chemical Co. of Freeport, TX, EDCX #120. The car was donated in 1994 by FMC Chemical to the B&O Museum, and was deeded as a gift to us in 2004. It was moved to Belington WV for restoration on October 20, 2006. The plan is to convert the tank car into an auxiliary tender for use with the WVN 2-8-0.